Never attempt to use welding equipment without professional help. Final touches, such as welded loops to tie your horse's head to, and other small extras, are always nice and can add to the functionality of your stocks. Handling the feet of horses is always a tricky business. Horses are flight-or-fight animals, and overcoming their instinct to be afraid of their feet being handled is a challenge even for the most experienced horse person. If you have horses that are a continuous challenge to work with for the farrier, then you may consider building some shoeing stocks. They can save you and your farrier from injury. Begin by creating a frame with heavy-duty pipe. Recommended dimensions, especially for draft horses, are 95 1/2 inches long by 42 inches wide by 88 inches high. If you will be working with standard-size horses, you may reduce these measurements by 12 inches. Include two rows of pipe on the upper portion of the stock, as this is where the horse is likely to lean. Weld two pipe extensions approximately 10 inches long by 5 inches wide at 45-degree angles upward from the base of the pipe frame on the front and back posts of the stock -- these will be the platforms that will hold the horse's hoof while it is being shod. Be sure and blunt these to hold the rounded shape of the hoof, not to mention to keep you or your horse from being cut. Weld two longer pipes to the back of your stocks to serve as "winches" for the rear feet. You can use the rope to tie to these and apply leverage to tie up a leg of a particularly difficult horse. Apply a heavy-duty metal sheet, covered with thick rubber or other padding, to the bottom of your stock frame. 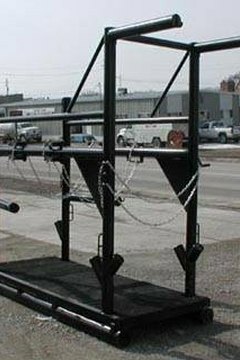 Weld securely as this will hold your horse during all his activities within the stocks. Finally, weld your chains to the frame, leaving one end loose to be attached to another welded closure on the opposite side. Ideally you should have two in the front and two in the back.